A completely secure compound with over 50,000 square feet of production space. The facility includes multiple Studios, Offices and a Construction/Paint building. Located directly off the Inland Island Highway (19) and Highway #4A with easy access to anywhere in the Mid-Island region. A ) – 50 X 175 – 8,750 sq.ft. clear span / ceiling height: 24 ft.
B ) – 60 X 90 – 5,400 sq.ft. clear span / ceiling height: 32 ft.
C ) – 60 X 114 – 6,840 sq.ft. clear span/ ceiling height: 32 ft.
E ) – 60 X 125 – 7,500 sq.ft. clear span / ceiling height: 22 ft.
F ) – 50 X 125 – 6,250 sq.ft. clear span / ceiling height: 22 ft.
G ) – 50 X 125 – 6,250 sq.ft. clear span / ceiling height: 22 ft.
O ) – Main Office: 4,000 sq.ft. Total Facility Space: 49,890 sq.ft. productions at our Stages and throughout Vancouver Island. camera and sound support. And much more, just ask! Please have a look at the website for further details. Click the logo and a new window will open for you! interested in filming on northern Vancouver Island. Click the logo for all your crewing and location scouting needs! We are located centrally on Vancouver Island near Parksville. The surrounding township is called Oceanside. Directly off the main Island Hwy we are easy to find and easy to get to. The local Qualicum airport is under 15 minutes away. are only 30 minutes away on our picturesque Island Highway. The Courtney Airport is less than an hour away. The West Coast of the Island is a beautiful drive and only 2 1/2 hrs away. Victoria, our provincial Capital, can be reached within 2 1/2 hrs as well. 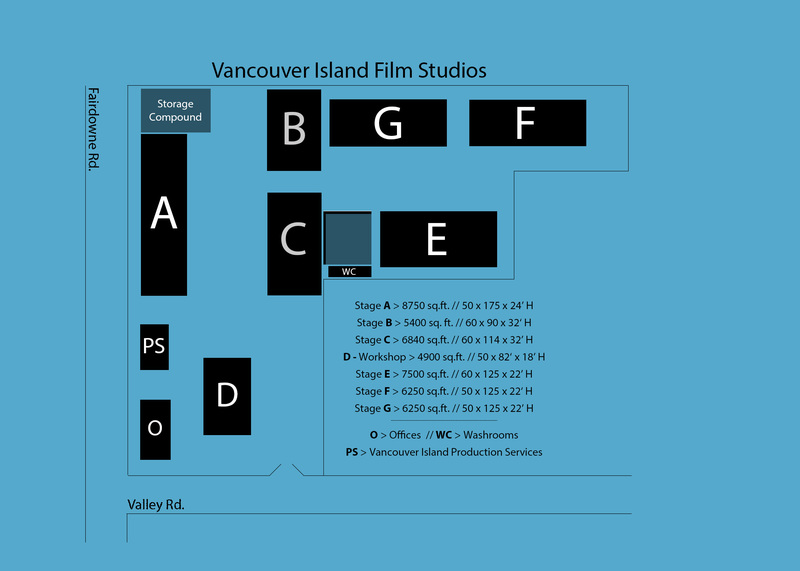 We're proud to announce the grand opening of Vancouver Island Film Studios! Like our Page for official updates and exclusive sneak peeks. We would like to send out a special note to all the people interested in working here at the Studio. We are grateful that so many have come forward offering their services, however we are not in charge of hiring for the shows that rent our space. they have a database of all the available personnel on the Island and make sure all productions coming to the Island have access. We also recommend getting in touch with your local union affiliations pertinent to the area you are wanting to get involved with. Here are some links to assist the hunt! There is a sense you get when you walk into a truly quiet room. It’s not so much what you do or don’t hear, although that’s part of it, it’s more of a feeling. Yes, you can feel it! It’s what happens when you walk into a truly anechoic acoustic environment. This is what I experienced when I toured the stages at the Vancouver Island Film Studio today. I’ve had extensive experience working in both the best and worst sound situations. I have recorded dialogue on dozens of movies and over 300 episodes of television. It is my great pleasure to give my endorsement to the Vancouver Island Film Studios. The attention they have given to the quality of the sound treatment on their stages is first class.